Developer Ara Kervandjian hopes to have another building in its place by the fall of 2016 – and not just any building, but a 12-story structure that will alter the look of downtown. "We think it's a gateway to State College," says Kervandjian. "We think the building is going to become a new entry way into the downtown and I think the retail component will hopefully boost the downtown business economy and attract other similar projects in the future." The Metropolitan is expected to include three levels of underground parking, one level of retail and restaurant space, one level of office space, seven floors of student housing and two and a half floors of general occupancy housing. Kervandjian says it is too early to say which businesses would move into the property. 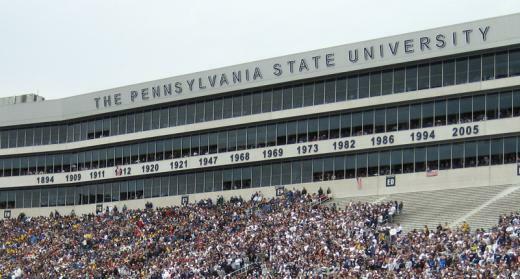 Penn State Football: Should Penn State Claim Two More National Titles? One would think that winning a national title would be fairly clear cut. It's not exactly an ambiguous feat in the modern day of polls and bowl games. You might have had a great season, but there isn't a lot of room for debate once the system runs its course. That will be even more true as college football introduces a playoff.